Picture it: any given NAFA flyball tournament, any given weekend. 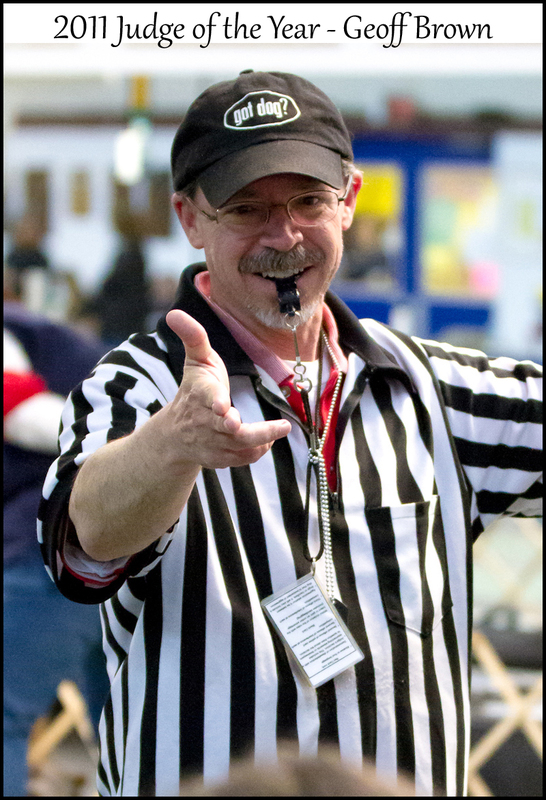 You look around and you will find Geoff Brown either judging, chatting with flyball folks, running a dog, answering questions for spectators, or any numerous other things. He has this way of being able to start a conversation with just about anyone on just about any topic. He has so many stories including life as a Canadian, travels/vacations, flyball statistics, friend's life stories and playing the bagpipes. Some are stories of different judging experiences as other judges approach him about how he feels a situation should be called during racing. Because of the number of tournaments he is asked to judge in a years time, Geoff has many experiences to be able to share with other judges, teammates or competitors alike. He has been asked to judge at CANAM this year (previously serving as a relief judge since its inception) and he recently judged at the national flyball tournament in Australia. Many clubs ask Geoff to come back and judge their tournaments year after year because of his experience and likable personality. Moral of the story = Geoff Brown is more than deserving of NAFA Judge of the Year.